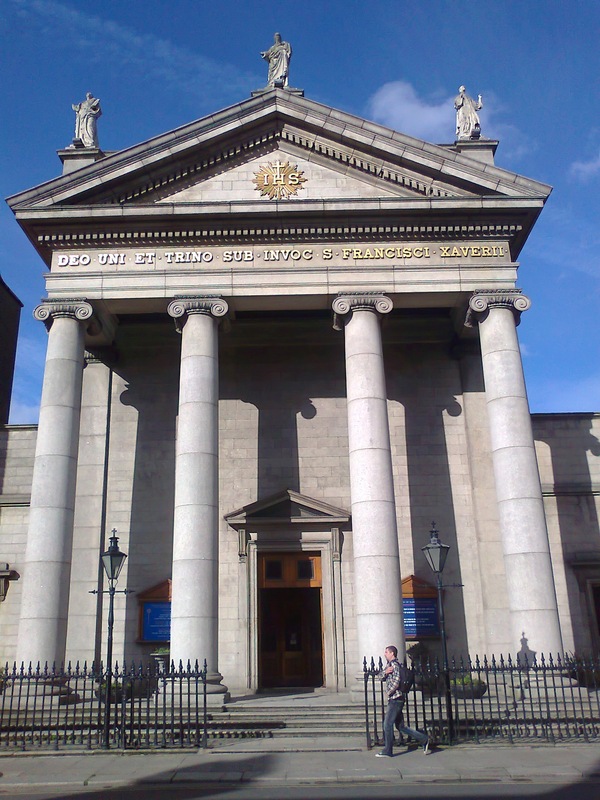 The Church of St Francis Xavier in Gardiner Street was one of the first churches to be built in Dublin after Catholic Emancipation (Catholic Relief Act) in 1829. The church in Hardwicke St opened in 1821. By 1829, however, it had become too small for the congregations. In that year, then, the first stone was laid, and the first Mass was said in the new parish church on May 3, 1832. The Jesuits had been in the Hardwicke St area since the 1730s, on the site now occupied by the Sacred Heart statue. They opened a school there, and in 1841 this became Belvedere College. Many well-known people of faith have been associated with the church. Among them is Matt Talbot, a recovered alcoholic whose cause for beatification is in process. He prayed in the church each day at the 5.30 a.m. Mass, and in fact died on his way to a later Mass in Dominic St Church in Granby Lane, on June 7, 1925. John Henry Cardinal Newman celebrated Mass here when he lived in Dorset St in 1854; his cause for beatification is in process too. Also, it can be surmised that Blessed Dom Columba Marmion visited the church when he was Professor at Clonliffe College. Gardiner Street Church is also the resting place of Fr John Sullivan SJ whose cause for canonisation is in process in Rome. His tomb draws a daily stream of devotees, as does the monthly Mass in his memory. Fr John worked for a short time in the church in 1907. Through local St Vincent de Paul and other societies attached to the sodalities, the church has made a big contribution to the life of the area at a time of great social deprivation. The Boys’ and Girls’ Clubs as well as the Altar Servers’ Club looked after the young people of the area. In 1974 the church became a parish church, and so is now more committed than ever to the people of the area. In May 2000, the Sunday Gospel Choir Mass was introduced. This style of Mass is an attempt to find a contemporary way of celebrating faith and Mass in a context suitable to today. The church has also been host to Liam Lawton, the well-known Irish liturgical musical composer in concert, and to Our Lady’s Choral Society. 1816: Jesuit church and school opened at Hardwicke St.
1829: Laying of the foundation stone of Gardiner St church. The school moved to the present site at Belvedere College, North Great Denmark St. The Novena of Grace took a central place in Dublin city life. First conference of the Society of St Vincent de Paul. Three conferences now aid the poor of the locality. 1898: Pioneer Total Abstinence Association of the Sacred Heart founded by Fr James A Cullen SJ. 1960: The body of the Venerable John Sullivan SJ was relocated from the cemetery in Clongowes Wood College to the church. 1974: Constituted as a parish of the Archdiocese of Dublin by Archbishop Dermot Ryan and the Jesuit provincial, Fr Cecil McGarry SJ. Parish Priest: Fr Philip Harnett SJ. 1984: Establishment of the Musik Makers for children of the area. 2000: The Gardiner St Gospel Choir founded.